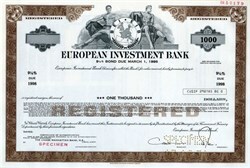 Beautifully engraved SCARCE $1000 Specimen Bond Certificate from the European Investment Bank printed in 1977 and 1978. This historic document was printed by the Security Colombian Banknote Company and has an ornate border around it with a vignette of two allegorical men flanking the organization's logo. This item has the printed signatures of the Company�s President and Secretary. The task of the European Investment Bank, the European Union's financing institution, is to contribute towards the integration, balanced development and economic and social cohesion of the Member Countries. The European Investment Bank is a nonprofit bank created in 1958 by the six founding countries of the European Economic Community (now part of the European Union [EU]). The bank makes or guarantees loans to EU members, principally for projects that will contribute to regional development within the union. Some loans are also made to nonmembers, including countries of the Mediterranean region and central and E Europe and, under the Lom� Convention and Cotonou Agreement, developing countries in Africa, the Caribbean, and the Pacific.